m3u Playlist Converter is a free program that takes m3u playlists from Winamp and other media players and creates mp3 cd's with the music and playlist. It can also be used to copy music to your mp3 player, make an mp3 DVD, or just organize your music on your hard drive. First download the m3u Converter. Then unzip it and open the folder. Next open install.exe and follow the the on screen instructions. You can run the program from the start menu and uninstall from add and remove programs in the control panel. 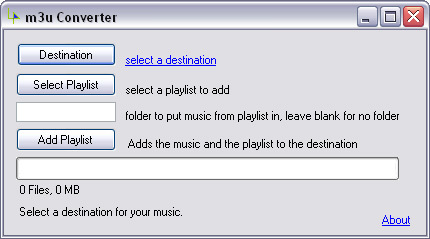 First off you select a destination for your music by pressing the destination button. A link will display to the right of the button and you can click the link to view the folder your music will be copied. Next you select an m3u playlist to add. You can make playlists with Winamp or other music players and export the playlist as an m3u. The m3u Converter program will copy the music from this playlist to the destination you picked, along with a modified version of the playlist that will work where you copy the music. You can type in a folder you want your music to be put in to keep it more organized. You can just leave it blank to keep it in the root of the destination. Now you can click Add Playlist and your music will be added. The progress bar will show the progress. It typically takes around a minute for every 50 songs, but it varies depending on your computer. After you have added one you can repeat the process to add multiple m3u playlists. After you finish you can close the program then use simply drag the folder over to your cd or dvd buring program if you want to burn an mp3 cd or dvd.